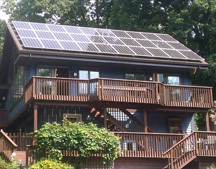 Energy Independent Solutions is trusted as the best provider of Solar Panels in Pittsburgh. If you would like to add a Solar Electric or Solar Hot Water System to your home, business or farm and you reside in Pittsburgh or Western Pennsylvania, call Energy Independent Solutions today. Our Pittsburgh Solar Energy Consultants will answer any questions you may have and we can set up a home visitation where we can assess your structure and location to see if Solar Energy will benefit your unique situation. We have the experience you want in a Solar Energy Contractor. We have installed hundreds of solar roof and ground arrays and use our own professionally trained installation crews. We use American Made Solar Panels with the best warranty and field performance ratings. Call us today! - Solar Energy Pittsburgh - Our solar panels have the best field performance rating in the industry. - 100% of our Solar Panel Installations out perform NREL (National Renewable Energy Laboratory) projections. We Make it Easy to Go Solar in Pittsburgh! - We are a local Pittsburgh solar company that does not use subcontractors. Our solar crews are professional and we encourage you to contact our clients to see what they say about them. 5 Solar panels can hold the weight of several people, even the weight of a truck. 6 Solar in Pittsburgh costs about the same amount to generate all the electricity you need for your home for the next 30 years for about the same cost as remodeling your kitchen. 7 Solar increases the life of your Roof by protecting it from hail and debris as well as reducing the heat loading from direct sunlight. 8 Solar makes no noise, has no moving parts, requires almost no maintenance and increases the value of your home. 9 Solar is a great tax shelter returning a full 30% of your initial investment in tax credits in the first year. At that rate can you afford not to build solar? 10 Buying solar in Pittsburgh is like fixing the cost of your electricity for the next 30 years. Duquesne Light has increased rates from $.059/kWh in 1994 to $.149/kWh in 2010….where do you think this rate will be in the next 16 years? With solar it will be Free. Once the system recovers its cost in the first ten years, you continue to get free power for a full 25-35 years. 11 Solar in Pittsburgh is true energy independence. Instead of paying the utility for electricity each month, they pay you. Instead of sitting in the dark when the power is out, you run off of your solar. Solar makes you your own utility. 1 Pittsburgh hosts the 'Greenest' building in the world and it is run by solar energy designed and built by Energy Independent Solutions. Phipps conservatory has built the Center for Sustainable Landscapes which is a building that generates all of its own power, processes all of its own waste water and is built to the highest building standards in the world including Living Building Challenge, LEED Platinum 2.0 and SITES initiative. 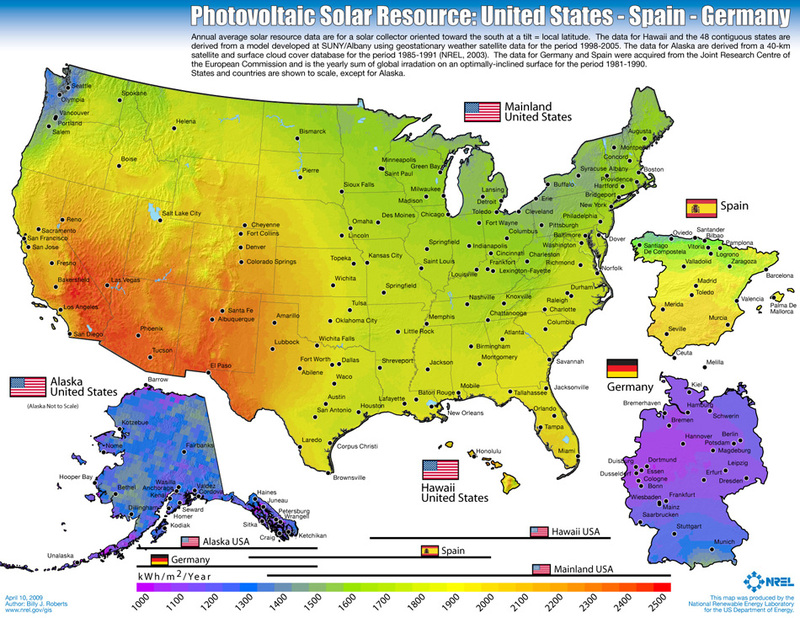 2 Germany may produce more solar energy than any other country in the world but Pittsburgh has better sun for harvesting solar than the best sun in all of Germany. 3 Solar has created over 4000 jobs in PA in the past five years and solar produces less than .01% of all of PA's electricity. There are only 7200 Coal jobs in PA and coal generates 56% of PA's energy. Imagine how many jobs would be created if we produced 56% of our energy from Solar? 4 Western PA hosts over 200 solar installations about half of which were designed and built by EIS. 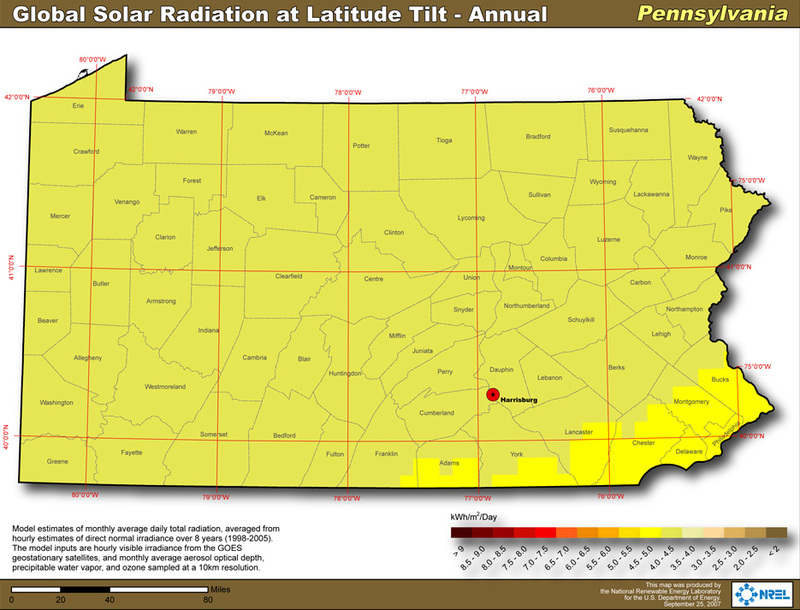 Click the maps below to see where Western Pennsylvania ranks with solar energy and why installing solar panels in Pittsburgh will benefit your home, business or farm. United States, Spain, and Germany.